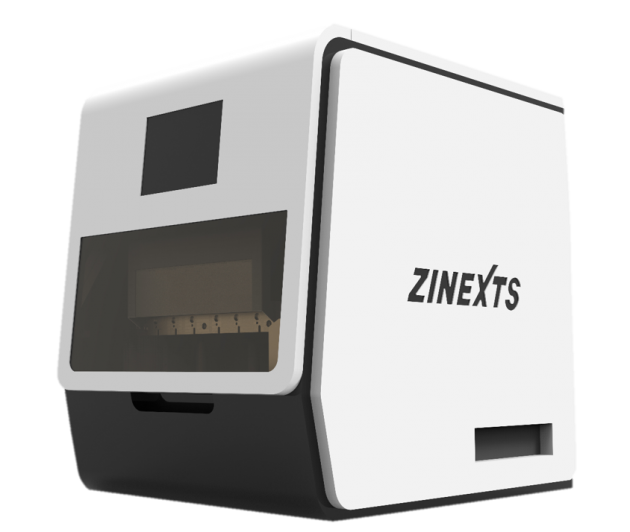 SoniMag® is a bench top fully automated sample preparation platform with a small footprint, that is using Zinexts Life Science's unique and patented state of the art Magnetic Sonication technology! The instrument is providing a homogenized sonication force to the process of purification according to sample type and DNA fragment size, enables rapid and efficient mixing, particle diffusion, washing and elution. The SoniMag® instrument process up to 8 Samples simultaneously. This advanced system delivers a consistant and reliable purification within 20-40 minutes, depending on Sample Type. 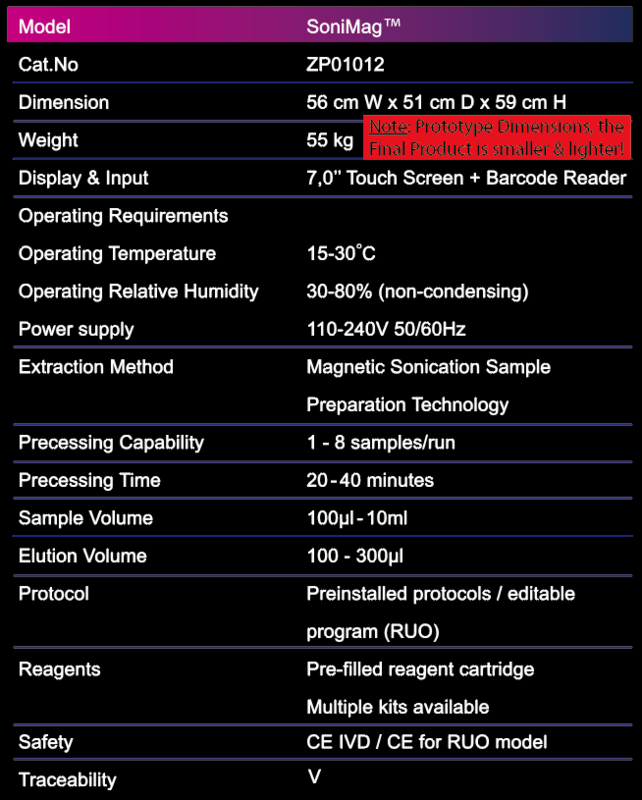 With pre-filled cartridges, pre-programmed protocols and pre-installed pillar cover, SoniMag™ is immediately ready for the easy and rapid extraction of your Samples. The intuitive graphical Touch Screen interface of the SoniMag® system let users easily set up the purification procedure, and displays the real-time process status of the progress. 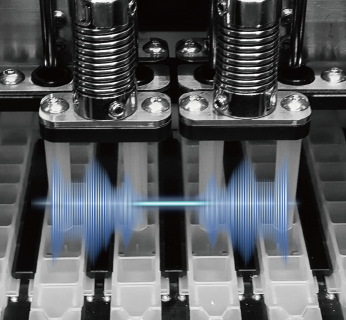 The unique and patented Magnetic Sonication Technology of SoniMag® delivers a gentle homogenized mixing and washing without any splashing and Cross-contamination. The SoniMag™ platform enlarges the great advantages over other automated extraction systems. Manual pre-concentration of cfc DNA Samples with enclosed buffers, allows a flexible and scalable handling of large volumes from 1 to 10ml. 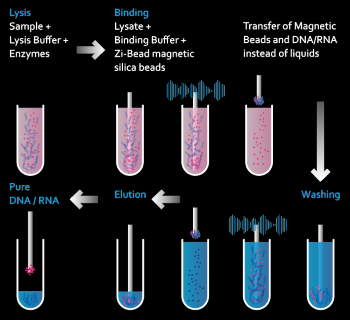 Subsequent cfc DNA cleanup on the SoniMag® system, provides a convenient automated magnetic bead-based sonication purification of up to 8 Samples simultaneously. SoniMag®'s RUO version allows the full protocol modification, creation and data upload, perfectly adaptable to advanced and changing research needs. Cell-free DNA (cfDNA) refers to short fragments of cellular nucleic acids detectable in body fluids, including blood, urine, etc., and is involved in various physiological and pathological phenomena such as immunity, coagulation aging and cancer. cfDNAs retrieved from Liquid Biopsy or Formalin-fixed paraffin-embedded tissue specimens (FFPE), are fragile and sometimes are the fragments too small to obtain enough DNA for NGS or even qPCR applications, SoniMag®'s advanced technology and its optimized Reagent Kits, let you purify the most out of your Samples. Nucleic Acids purified with the SoniMag® platform are compatible with a wide range of downstream applications such as Next Generation Sequencing, Arrays, qPCR, digital PCR, or other precise clinical and research sub sequent uses. Our SoniMag® product line will be available at our Global Distribution Partners, and the recognized Scientific E-commerce platforms Bidscientific and Zageno. Feel free to get in touch with us to learn more about our Distribution Partners and/or Partnership Opportunities!